St. George’s Grenada, July 5, 2010- Monday Night Mas enthusiasts can look forward to an Explosion of Colour as Digicel, Flow and Westerhall Rums brings a Kaleidoscope of colour to the 2010 Monday Night Mas Parade. The band was launched during a press conference held at Digicel’s Headquarters on Monday 5th July 2010. 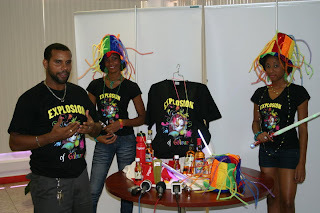 The Explosion of Colour pack includes a T- shirt, Lighted Multi Coloured top-hat with glowing stings’, Multi functional and multi coloured lighted baton, Glow party mug from FLOW, assortment of Westerhall Estate Rums including unlimited refills during the parade, and a water bottle, bandana or water proof pouch compliment Digicel. The band will be powered by the Waggy T Sound Company and patrons can expect performances from the 2010 top Soca Artist throughout the parade. To add even more glow, lights and fanfare to the night, patrons can look forward to additional giveaways from the sponsors throughout the parade. Packs will go on sale as early as next week and masqueraders can expect to pay approximately $60 in addition to VAT. Carnival is Colour! 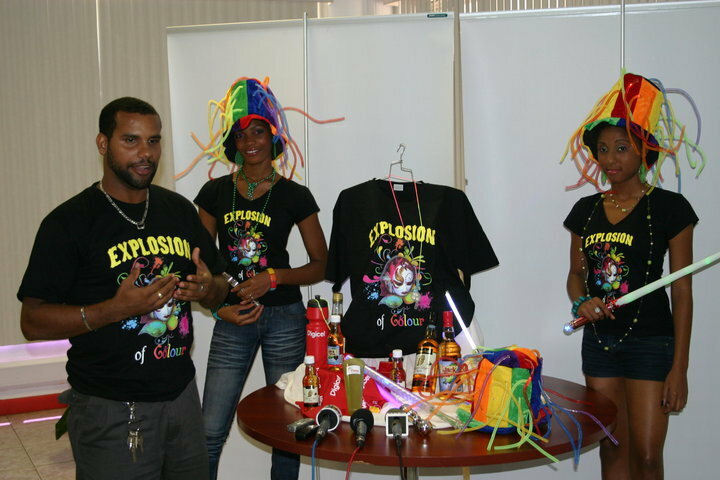 Digicel, Flow and Westerhall Rum promises to bring an Explosion of Colour to Spice Mas 2010.